With just the right amount of pomp and ceremony, the first ever silver crown coin series to be issued from the Central Bank of Ireland was launched on October 13, 2010. 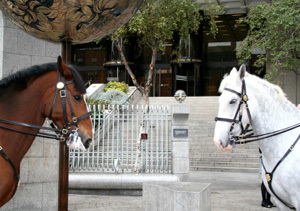 Accompanied by two mounted Policemen of the Irish National Guard at the steps of the Central Bank’s entrance on Dame Street in Dublin, the coin series entitled “The Animals of Irish Coinage” officially went on sale to an eager group of Irish coin enthusiasts. 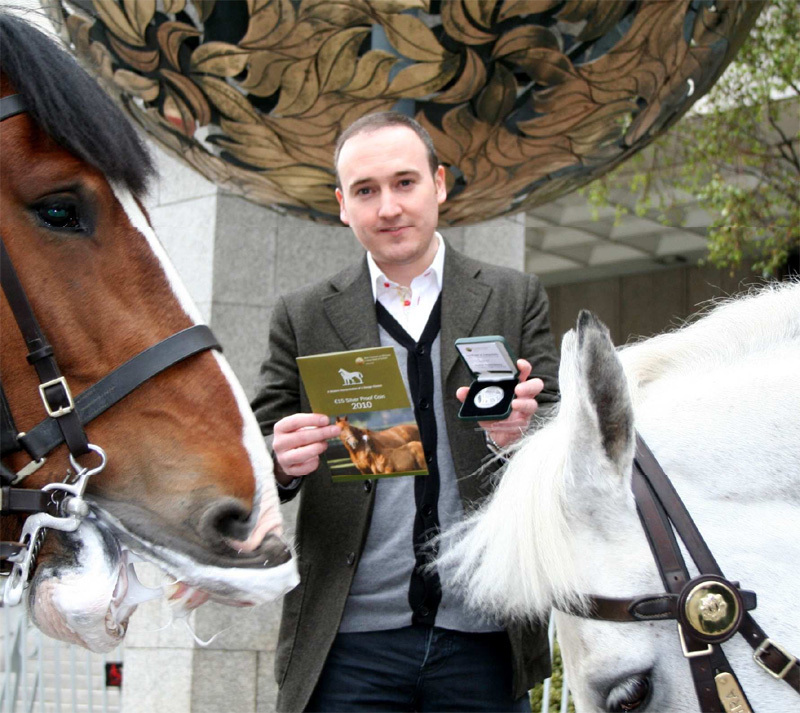 The newly launched series highlights the images of animals that have appeared on the nation’s coins since Ireland’s independence in 1921. 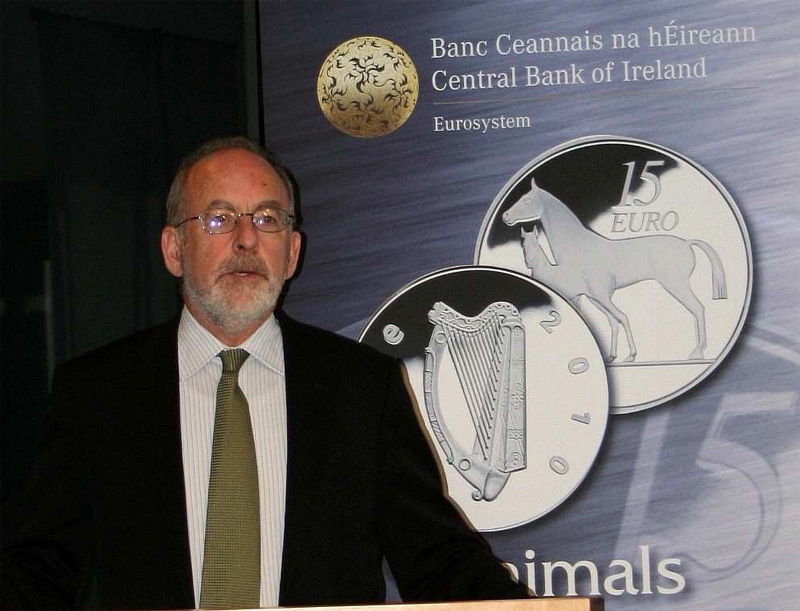 On the top floor in the Central Bank’s executive boardroom against the backdrop of a panoramic view of the city, the ceremonies commenced with several invited guests from the media and Ireland’s Numismatic field as well as the designer of the new coin, Emmett Mullins. Also in attendance and presiding over the launch was the Governor of the Central Bank, Patrick Honohan who made a point of commenting on the importance that agriculture had to the economy of Ireland during the time of the establishment of the Irish Free State in 1921. He mentioned that it was only fitting that the coins of the time depict aspects of farming and how the designs of Percy Metcalfe captured the spirit of the era and how they had been almost unanimously chosen by committee whose task it was to shape the nation’s coinage back in 1926. The new series will consist of three crown size silver proof coins which will include as the main feature, the designs from the original set of the well known and much loved Metcalfe circulation coins first issued in 1928. 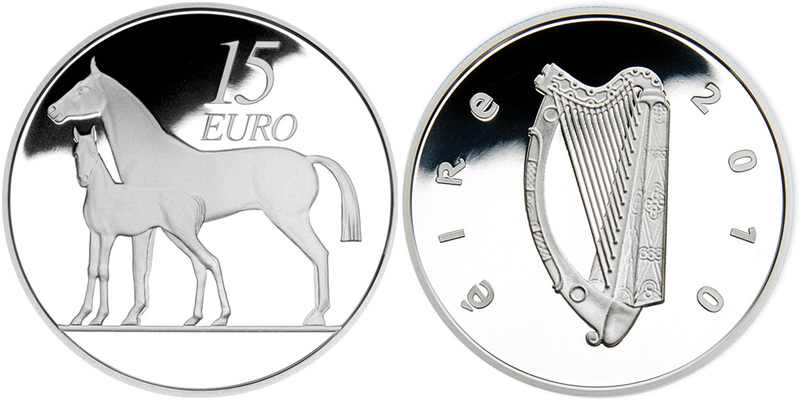 The addition of the animal’s offspring symbolizes the next generation of Ireland’s present currency, the EURO which at only eleven years old, is still technically in its infancy, thus the addition of the younger animal. The new series is the work of Emmet Mullins, who has designed previous Irish commemoratives such as the Ploughman coin issued in 2009 and Samuel Beckett’s 100th anniversary of birth coin issued in 2006. Emmet describes how he approached the task of replicating the iconic Metcalfe designs whilst adding the element of a new generation and thus giving greater significance for the Metcalfe designs to appear on EURO coinage for the first time. Three of the original animal designs transitioned onto the decimal coins introduced in Ireland in 1971, with the one and two shilling coins being issued as new five and ten pence denominations. The issue of a new fifty pence coin was introduced with the portrayal of the woodcock (previously seen on the farthing). A new 20 pence coin was added in 1986 and once again, one of the previous animals, this time the Irish hunter horse (first used on the half crown) was placed on this denomination. Ireland originally featured a group of farm yard animals on their circulation coins, which made their debut in 1928 after a two year consultation of a committee made up of prominent persons whose task it was to decide what the country’s coins should look like. The considerable importance of agriculture in the Irish economy was the main reason for the choice of motif. One specific set of designs stood out among the many hundreds submitted. These were the work of Percy Metcalfe, at the time a thirty-one year old artist who had submitted eight animal designs as the brief had described. In 1926, the committee responsible for the introduction of Ireland’s new coins, coincidentally chose all of the un-named designs submitted by Metcalfe for the denominations and they eventually made up all the circulation coins issued, from the farthing to the half crown. Metcalfe’s work did not just include this Irish coin series, he also designed the prestigious George Cross in 1940, and in particular, the portrait of H.M. King George VI which appears on the obverse of the award. He was involved in the design of the Great Seal of the Realm of the United Kingdom. Metcalfe also produced designs for the coinage of several other countries including Australia. He designed a portrait of H.M. King George V which was used on the obverse for coins of Australia, the 1935 commemorative Dollar of Canada, Fiji, Mauritius, New Zealand and Southern Rhodesia. Would you kindly add my name to your email listing for your notes and coins? I am interested in the new “Barnyard” Euro Coin Series, as well as your other offerings.